The need to set up excellent spaces for working at home has skyrocketed in recent years. Many businesses are increasingly willing to allow team members to work from home, and freelancers know that nothing beats a killer home office for a lifestyle that’s both productive and creative. To get a leg up on forging a great work-life balance, here are six tips for creating a successful home office. Tip 1: Use a room that has just one purpose. The ideal home office is a dedicated space, ideally a dedicated room with that purpose with minimal distractions and good access to natural light and air. There are several reasons for this. When you first started working at home, you might have been able to get away with sitting your laptop open on the couch or at the kitchen table. Psychologically this is problematic though, as you're more likely to get into and stay in the mood for working when you're in surrounds that you associate with work. Secondly, if you can close the door to any and all paperwork when it is time to relax means that the dining room table and kitchen counters are no longer loaded with paperwork. Plus it allows you a similar separation to " Leaving your work at the office". Even a clever "pocket office" - a built-in closet where you can put your work at the end of the day can have the same effect if you don't have the luxury of a full room for your home office. Thirdly, researchers have found that telecommuters' family demands interfere more with their work than the other way around. Family members who would be reluctant to interrupt someone in the work place had no such reluctance to interrupt at home. Having a distinct office space may make the boundary more distinct, and help minimize those intrusions. Tip 2: Focus on usability and comfort. Just because it's a home office doesn't mean it needs to be uncomfortable. 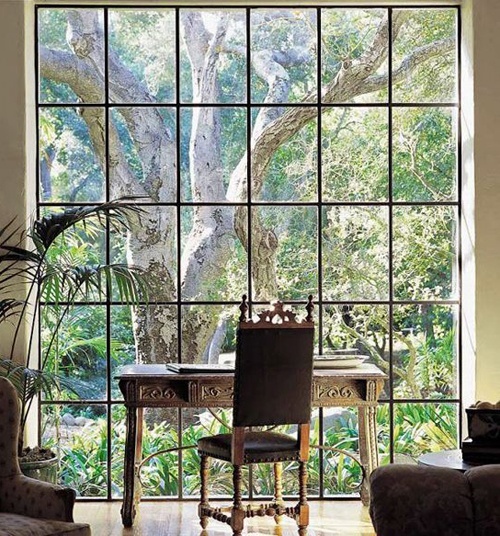 The best home offices are ones the incorporate good feng shui and ergonomic principles. You're worth it. Be creative with your desk. Big desks with giant leather chairs are for big formal offices. A smaller writing desk or work surface, or an adjustable height work surface may be better suited to your at home office style. Consider stand up desks that allow you to sit or stand during the day as your work flow permits. Sitting all day just isn't good for you, and one of these desks can allow you to make a significant change in your life. Make your own counter out of a material you love, and you'll love working at it. The right chair is super important, so don’t skimp. Get a comfortable chair and make sure you adjust it to the right height. There are many chairs available that offer adjustable angles, heights and head rests. While you are working, take lots of breaks to rest your eyes, clear your head and stretch your body – at least once every hour. Splurge for a great monitor, keyboard and mouse. Ideally, clone your office work station at home a same keyboard, same mouse, same monitor, same layout. It allows you to smoothly transition from one to the other. If you're working on an iPad or tablet, extras such as a snap-on keyboard or Bluetooth speakers make work life easier and more comfortable. Make sure you've allowed for plenty of handy outlets in the room layout for plugging in everything for recharging. Tip 3: Enjoy the view. My home office looks out a triple glass door at the backyard. An efficient office doesn't have to be bare and sterile. Surround yourself with thing you love to look at, whether it is art prints, photos, sculpture or plants ( which improve air quality). When you are happy your productivity increases. Tip 4: Organize your stuff. Organize your stuff to keep yourself sane. People who work from home are likely to spend the vast majority of their work hours online, with files in the cloud. With box.com and a scanner, you can keep all your documents easily accessible, regardless of where you are, even from your iPhone in the middle of nowhere. Your files will be maintained on line, and synced to multiple desktops/laptops as you wish. But even the most web-based worker occasionally needs to interface with the physical world. If you have a real office and an at home office, part of working at home typically means picking up your paperwork and taking it to the office. 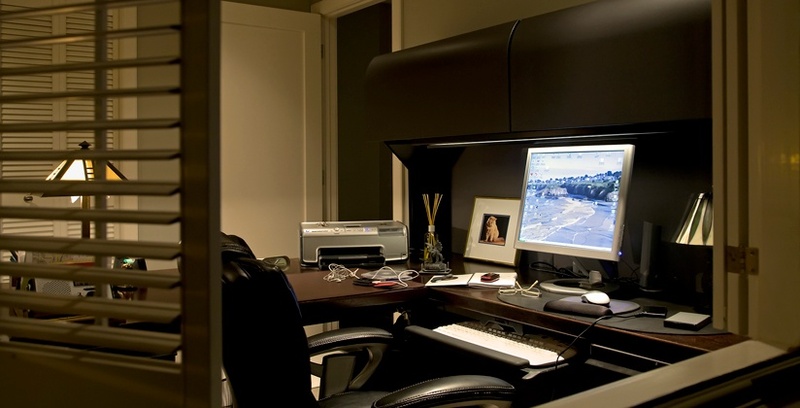 Keep these aspects of your work day in mind as you design your home office. An expandable folder or binder with tabbed pockets can compactly keep your papers organized, as can a wall-mounted tray system. Color-coding helps too. Treat yourself to some of the innovative, practical, space-efficient products for sorting and storing files. Invest in colorful Pentaflex folders and a briefcase you love. If you find yourself working on-the-fly, in the train, or in multiple locations, a well organized briefcase will help keep everything in line, and is an extension of your home office. Tip 5: Make your space Facetime-appropriate. When you work remotely, chances are that you will do some FaceTime or video conferencing. It's fun to work in your pajamas, but keep the fuzzy slippers under your desk and the view behind you as simple as possible. Adding built-in cabinets, shelves and bookcases can be a great way to maintain a clean look and provide a place to get papers out of sight when you have a meeting or video conference. Tip 6: Working "at" home but not "in" the home. If you don't want to commute, but still need a quiet place to think, away from the comings and goings of family life, consider a detached home office. It can be similar to a guest house; your own private work space just steps from your door. It can be a room over a detached garage. These spaces combine the convenience of a home office with the physical and psychological separation between "working" and "relaxing" that is often missing when you work from home. If you don't have space for a full room, consider a Pocket Office, a workspace carved out near the high-traffic areas of the home, often in a closet with the door removed of in an alcove. It may be the hub for home management as well as your "office"; paying bills, coordinating the family's schedules and keeping everyone organized. Working from home in your pajamas with a cup of joe in hand is something many of us dream of. Carving out some space for a home office that welcomes you with plenty of work area, lots of storage and wonderful natural light is the first step in the transition to a better work/life balance.